My past few weeks have been spent watching, rewatching, and blathering on about “Long Way Round” and “Long Way Down”; two motorcycle documentaries made by Ewan McGregor and Charlie Boorman. 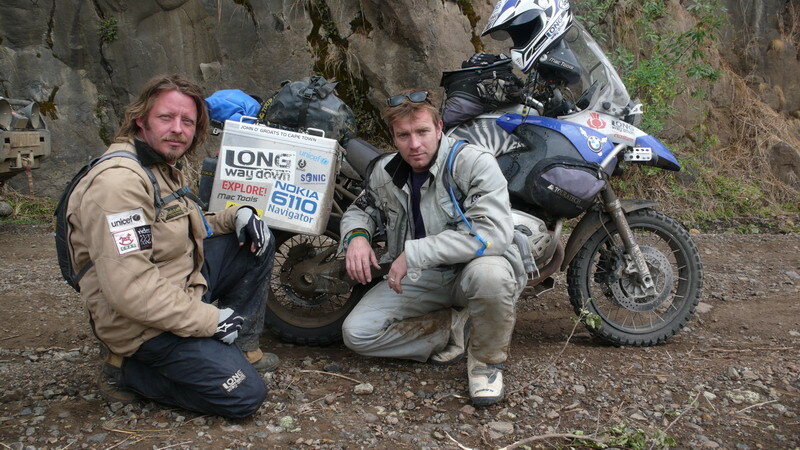 “Long Way Round” is the first trip with Ewan and Charlie and they ride motorbikes from London to New York going east, or “the long way round”. The boys spend three and a half months traveling through France, Belgium, Germany, Czech Republic, Slovakia, Ukraine, Khazakhstan, Mongolia, and Russia before flying across the Bering Strait and crossing Alaska, Canada, and America. Filmed with one cameraman on a third motorbike and a support vehicle to meet up with them at borders, the filming is bare bones and perfect. Their sense of adventure is incredible and the people they meet and the places they ended up in truly makes this the trip of anyone’s lifetime. I loved seeing them go through Ukraine and Russia and was rather envious of their experiences there, although I think Mongolia and far East Russia were the highlights of the trip. Ewan is also a UNICEF ambassador and in both trips they make stops at UNICEF centers to highlight the plights of children around the world, which is never a bad thing. As for the second film, well, I have a tendency to find a new interest and become obsessively immersed, so of course, I heartily enjoyed it, though I must admit that it was not as interesting as the first. “Long Way Down” has the boys ride from the northernmost tip of Scotland to the southernmost tip of Africa. The trip seemed more rushed this time and Ewan’s wife decides to join them for a stretch in the middle, which puts everyone on edge and changes the group dynamic. Still, the series is fascinating and it shows a much more colorful and less horrific picture of everyday Africa than one normally sees. Both films have made me ridiculously heart-sick for adventure and I do recommend them both! I absolutely love these! 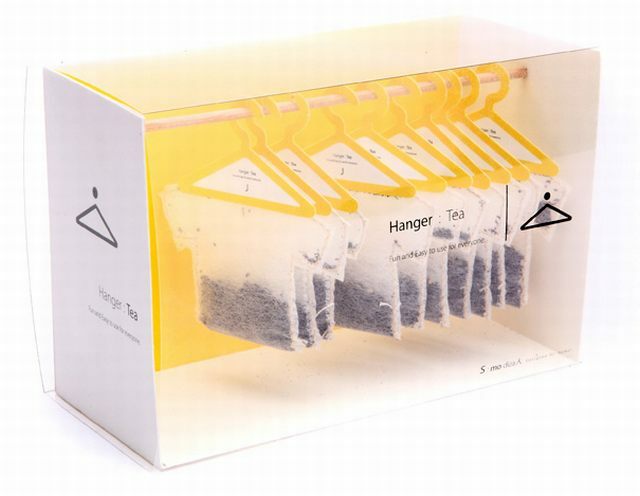 Hanger Tea was featured in Ad Age’s Creativity a few months ago, and I have been enthralled with them ever since. Cute and functional. I came upon a bird the other day. I was walking down upper Wacker drive to meet a friend for lunch and passed a sparrow sitting in the middle of the sidewalk. I approached, I passed, and he did not move. His little head shook right and left tremulously with every passerby, which was no small number given that he was in the middle of a very busy sidewalk, in a very busy city, on a very busy day. I stepped around him and got maybe fifteen steps before turning around and looking back. Most people seemed to slow down around the poor thing and he didn’t escape anyone’s notice, yet what was to be done? He was probably ill, or injured. He’d most likely die. He was going to perish on a vast, hot, stone sidewalk. I stood indecisively, watching the procession of businessmen and women arcing their strides around the poor little thing. I should do something…call someone, I thought to myself. No, no, there’s nothing to do. But he’ll die. And he looks frightened. It seemed too cruel to leave him so I walked back and knelt in the middle of that very busy street and scooped him up in my hands. His fragile body trembled and he feebly attempted to struggle for a moment. Then he calmed and let me carry him to the side of the street and place him gently in a raised planter. I sat him in the soft earth underneath a little tree that offered him shade and cover. At the very least, he wouldn’t have to die as fearsomely gargantuan oiled dress shoes and heels tromped every which way about him. I was being watched curiously by some and in disgust by others. I assume they were repulsed that I would touch a bird. Then I went to lunch. An hour later, I was walking back along the same sidewalk and I went to check in the planter. My little bird was gone. When looking for the text online, it seemed funny to me that the first notation on Wilde’s fairy tales was a precaution that his stories are not for children. However, Wilde wrote them for his two sons and they were/are very much for kids. I finished “Birdsong” and I have to say that I am disappointed. In expecting an equal to “All’s Quiet on the Western Front,” and having heard that “Birdsong” is a must-read in terms of both WWI history and general Brit-lit, I was more than a little let-down. 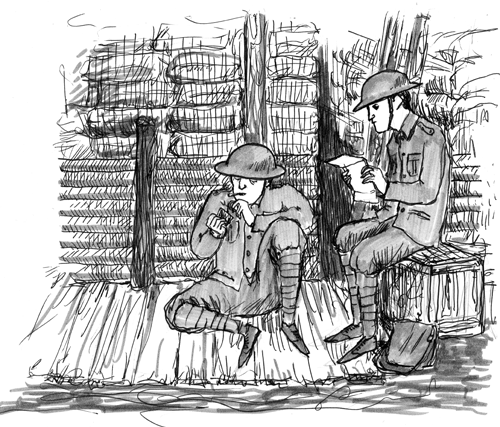 While the war-torn visuals were staggering and the trench warfare perfectly written, the relationships fell flat. 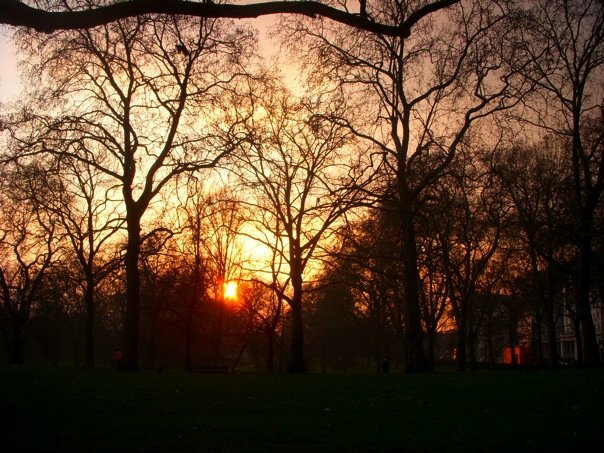 I won’t ruin the novel for anyone, but near the end of the book, there is a perfect moment. A second of pure emotion that seems to capture the fundamental essence of the war and all of the subsequent horrors, tribulations, and the futures both promised to and taken away from everyone involved, from the white-haired children back home to the ghost-eyed veterans. But that is all taken away. Faulks trundles on through a mundane and unsatisfying “conclusion” – if it can be called that – to Wraysford’s personal life that adds nothing and detracts substantially from the last stunning portrait of the war…and more importantly that of the soldiers. I so desperately wanted to fall in love with this book, and I’m a bit heartbroken that I didn’t. So now I have moved on to “The Swimmer” by Zsuzsa Bank. Again, we fall into wartime territory, but in a very different landscape. Set in 1956, Hungary, the book deals with the Hungarian Revolution against Stalinist rule and the toll taken on one family. When Kalman and his two children find themselves abandoned by their mother, who flees to the West without a word, they too flee their home in a rambling, disjointed journey throughout their country. What the book lacks in plot, it more than compensates for in the eloquent prose of the daughter, Kata. Her voice is utterly beautiful and compelling as the broken family moves continuously from place to place, her Father practically comatose and her brother desperately trying to make connections to anything and everything. I’m only half-way through so far, but I will confidently recommend this book to anyone. I look forward to giving a more positive final verdict on this one. I’m currently about halfway through Sebastian Faulks’ “Birdsong: A Story of Love and War,” but I’m not sure what to make of it. I have always been incredibly drawn to WWI and many of my favorite books are British novels dealing with men sent to Passhendale, Ypres, Flanders Fields, and the like. The first quarter of the book deals with an affair that is tremulous at best and never really captivated me so I was excited to reach France 1916…or I was before I got a few pages in. I was quite fine until an infantryman had to go down into a tunnel seventy feet below ground. With a gun to his head commanding him to march into the suffocating crawl-space to listen for Fritz, and unable to quell his terror, he crawls halfway through before collapsing and sobbing into his lieutenants chest. For some reason, I cannot shake that image from my mind, despite far-worse tableaus having been vividly etched by Faulkes. Sometime I wonder if America had been invaded like Britain had, if we were surrounded by that history today, I would still find the subject so interesting. To this day I’m still a little pissed off that grammar school so wholly glossed over WWI. The re-teaching of WWII every single year of childhood was more than anything desensitizing and not a single childhood teacher encouraged any remote semblance of critical thinking by providing the historical framework that led to the second world war. Apparently our delicate little minds could handle the holocaust but not the Somme? I will never forget visiting a cemetery off of a nondescript road in Belgium. 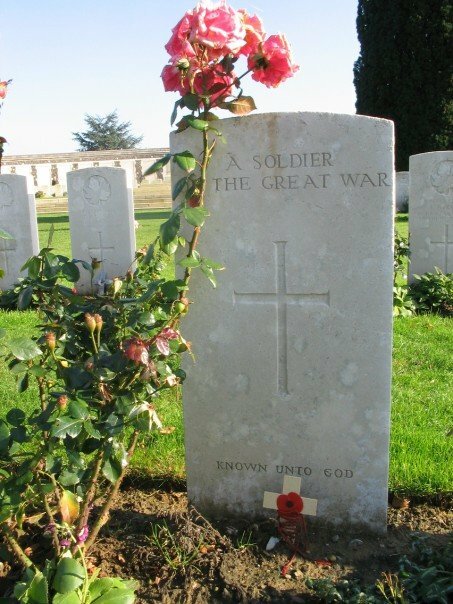 We walked slowly to the center, between innumerable rows of bleached headstones reading simply “A Soldier of the Great War, Known Unto God.” Reaching the solitary tree standing starkly against the pale sky, we found ourselves unable to see anything but markers of the dead. The loss is so incomprehensible, and in return for the loss books are written, poems recited, and memorials sprung. I feel that it is an important responsibility to read the records and remember the men even if it feels uncomfortable and so far removed. I have no agenda concerning the morality of war, I’m simply working out my own thoughts as I continue on through such a thought-provoking book. So, below is a poem by Wilfred Owen, one of the most notable poets of the Great War.